Already own a home in the Jubilee Point subdivision? Thinking of selling? Click here and read about current search trends & our web network. Jubilee Point homes for sale in Fairhope, AL are listed on this page with pictures, maps, property details and other helpful info for homes for sale in the Jubilee Point subdivision in Fairhope Alabama. The homes are located just South of the abrupt 90 degree turn on highway 98 when the road goes from due South to due West. Jubilee Point subdivision is approximately 15 minutes from downtown Fairhope and approximately 40 minutes from the beaches in Gulf Shores, AL, Mobile, AL has the closest regional airport and takes about an hour depending on traffic. This area of Fairhope is a short drive from numerous restaurants, shopping boutiques and entertainment venues. Fairhope has consistently been voted as one of America's favorite places to call home. The school systems are among the best in the entire state and the proximity to the various bodies of water, wooded areas and beaches makes for a great outdoor paradise. This area of South Alabama is a great place to raise a family or start a family and home to a diverse collection of activities sure to make life enjoyable. Please let us know if you would like further info for Jubilee Point or any other homes, condos or real estate in the area or would like to schedule a private viewing by emailing info@condoinvestment.com or by calling 251-Area-Pro (251-273-2776) for immediate assistance. 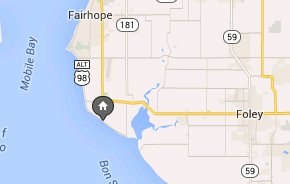 Jubilee Point is located right off County Rd 1 and is about 20 minutes away from the cities of Fairhope and Foley. Residents have quick access to restaurants and great shopping such as Fairhope's downtown district filled with art galleries and boutiques. The pristine beaches of the Gulf of Mexico are approximately 40 minutes away from Jubilee Point. For more information on beach real estate for sale, please visit our Gulf Shores condos and Orange Beach condos pages.